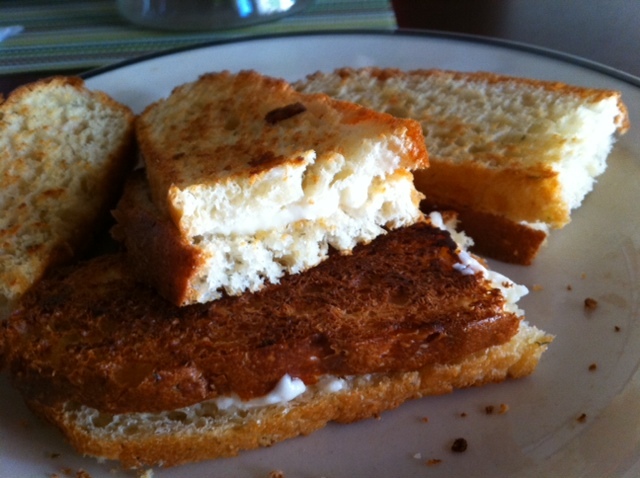 It's a safe assumption the original grilled cheese was conceived much like this one, as a quick and tasty sandwich improvisation. We just happened to have some fresh Mexican farmer's cheese in the fridge, and we just happened to have some couple-days-old bread mom baked. Not just any plain bread, but cottage cheese and dill bread, a big, flat, round loaf of it. So we sliced it, tossed it on the griddle, dropped bombs of queso on it, splashed on some Tapatio hot sauce, and there you have it. Slightly spicy, very cheese, and very savory from the homemade bread. Plus, crunchtastic.